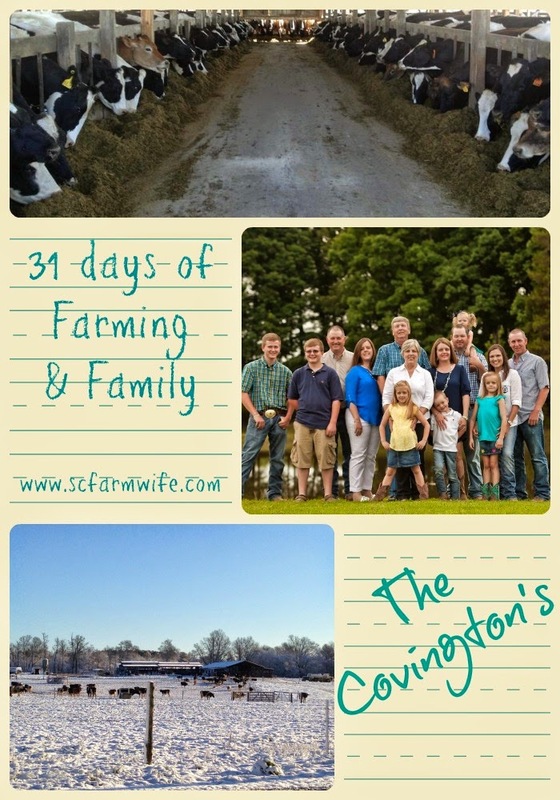 Today is Day 30 in our 31 days of Farming and Family. Over the last month we have met a lot of farm families from across the US & Canada. Some of them have been close friends that we love dearly. I can honestly say that today's farm family is more like an extended branch of our own family. My husband has grown up with this family, their parents are friends, they went to the same church, same schools, have traveled together, stood beside each other as they said their wedding vows. And now the 2nd generation is sharing in the same memories. Honestly I think I had to get "approved" by both the Nance's & the Covington's before the farmer asked me to marry him. Both farms are in the dairy business and neither started out as dairy farmers. Between the 2 farms they have more cows in the town limits of McConnells than there are people...and neither would have it any other way. So grab a cup of coffee and enjoy learning about this amazing farm family! We are Bill & Peggy Covington of McConnells, SC. We have 3 grown children Carrie (2nd from Left), Abbey (Far Right), & Craig. Our farm began years ago when I (Bill) was still working full time at a local university. I would do the farm work before and after my full time job and any days I had off. In 1995 we began full time dairy farming. Our farm is mainly a dairy farm. Our purpose is to provide the milk that ends up on the grocery store shelf. In addition we keep some beef cows and produce feed and hay for our cattle. The busiest time of the year for us is in the Spring/Summer when we are growing and harvesting hay and feed for the cattle. When the kids were growing up each had a job on the farm. Our 2 daugthers have gotten married and work in the education field. My son is now a partner and helps on day to day operations of the farm. Our grandkids enjoy the farm by showing dairy cattle and feeding baby calves when they are here. I serve as a Town Councilman for Town of McConnells and on the board of directors for Farm Bureau. My wife is also active off farm filling many roles, one of them being a Sunday School teacher. Family time is usually enjoying a meal together during a break. Everyone in our family has had to "pull their weight" over the years. Our family has survived on the farm. It has paid for college tuition and more. 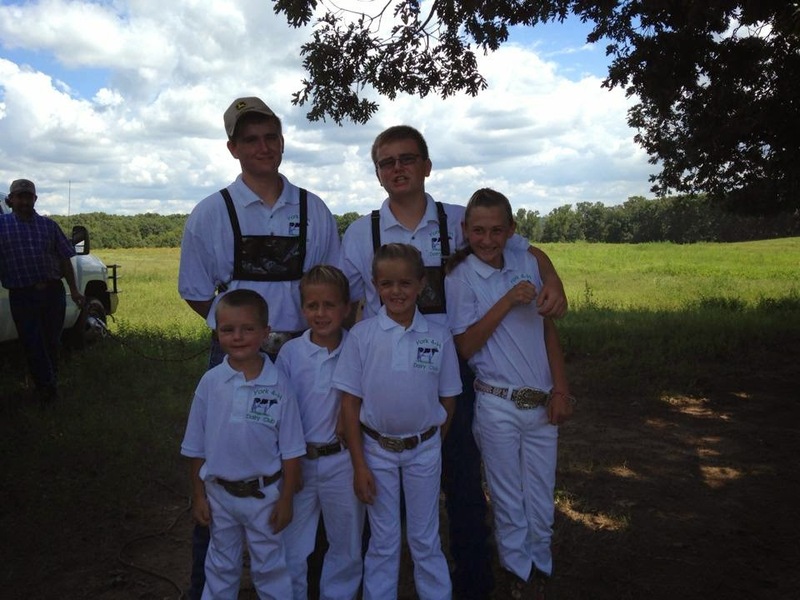 The farm has allowed us to pass on values to younger generations. It's hard to separate our family from the farm as its an essential part of our life. That food comes from a farm, not the grocery store! Farming is a 24/7 job and very hard work, but rewarding! Thanks for joining us for today's feature farm family. We have been truly blessed by their friendship over the years. I love that our farm kids get to continue this fellowship!